Bacon and white wine make up one half of the ingredient list — you know this will be good. 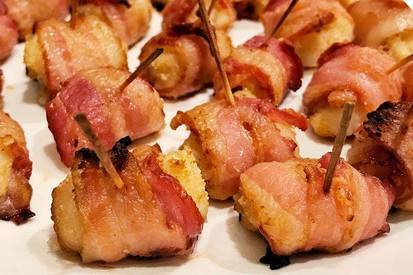 Scallops wrapped in Bacon are a tried and true hors d'oeuvre with a wide reaching appeal. This rendition makes for the tastiest bite-sized scallops ever, because of a simple, secret step at the beginning of the recipe!